See my YouTube page for videos. Thank you to my 5,000+ subscribers! All originals Copyright © 1996-2008 Rob Martino. 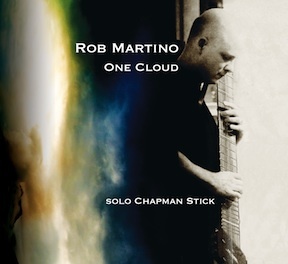 The new recording of One Cloud was done in Oct 2007 on a Macbook Pro and Logic 8 using my effects rack of Boss processors. The 2005 version was recorded with Ableton Live. This demo of Conscious Stream was done on a Mac G4 and Ableton Live and my Boss effects rack. For Noodle Soup, all the effects prcoessing was done in software with Native Instruments Guitar Rig. A few recording attempts at some Jethro Tull arrangements I'm working on for solo Chapman Stick... I've always loved those acoustic Tull tunes spread across various albums, and Ian Anderson's acoustic guitar technique is a big influence on my Stick playing. Wond'ring Aloud, Slipstream, and Cheap Day Return were re-recorded in 2009. A Reunion A simple rendition (no fancy effects processing) of a favorite Gentle Giant tune of mine. This is just the Stick and Acoustic Image Coda R combo amp. These are a few rock pieces that feature multi-tracked Stick (Mighty Wren) as well as electric guitar, Rickenbacker bass and synth (Differential and Rush to Judgement). The drums are performed with an M-Audio Trigger Finger. All the effects processing for the instruments was done with Guitar Rig 2 and songs recorded and arranged with Apple Logic. These older rock instrumental demos were recorded on a vintage Mac Quadra 610 with Opcode Vision around 1996-98 and are fairly progressive rock inspired, with elements of bands like Marillion, Rush, ELP, and King Crimson. Warning: There is some prog-rock goofiness going on here, involving "soaring themes", wacky chords, awkward song structures, fake synth brass sounds and other "lush keyboards". Perhaps visions of wizards and dragons will come to mind as you hear these, or intergalactic space voyages. What can I say I was (am) a geek. Not to mention there are some rough edges here, performance and recording-wise. But I figure there are a few good ideas amongst the generous amounts of cheesiness. Apart from the predominantly synthesizer oriented sounds, the piece Polyrhythms incorporates some Chapman Stick, and all have some degree of electric guitar. Wondering to Myself is a guitar/flute duet, an acoustic piece along the lines of Jethro Tull. My one and only experiment with alternate tuning. Created in 1999 using a Kurzweil K2000 synthesizer which allowed different tuning systems, this piece uses Wendy Carlos' Alpha tuning, in which every step is 78 cents (there are four steps per minor third), with 15.385 steps per octave (thus there is no pure octave). I like the surreal "otherworldy" sound of the tuning. A grad school experiment gone terribly awry! Written in 1999, this is a rock piece that borrows sound samples from a few different sources (a "soundscape" from a King Crimson album, a Marillion vocal clip, a Beethoven documentary, and an Edgar Varèse orchestral piece). The sound sources are "convolved" together to create new textures, and slowly become more distinguishable as the piece develops. Kind of weird, not for the faint of heart! Another grad school project, using good old fashioned electro-acoustic music techniques and equipment-- tape splicing, analog synthesis with patch cords (an ARP 2600) and an old Emu sampler. The most experimental piece I've done, which explores various musical expressions and textures only possible with electronics.